You will smirk until the last Peanuty-tense moment. To launch the Audi R8 in Brazil, Bullet created a launch event, "The Art of Performance," which combined an orchestra of 41 musicians, one maestro and three Djs from the German Bauhouse group along with visual wizardry from Campana to create a performance masterpiece. Masterpiece is the right word to describe this effort. Like an orchestrally-choreographed movie score, this aural and visual extravaganza is perfectly timed and does a nice job illustrating the car's finer points. Looks like that cool, drag and drop-style computer as seem on CSI Miami and in the Tom Cruise movie Minority Report will be available for all courtesy of HP. With beautiful visuals and lush music, Psyop (production), Sound Lounge (sound) and Goodby have crafted a nice piece of work for HP's TouchSmart PC. Now, if only the experience of using a computer was as blissful as this as opposed to the frustrating nightmare it often is, life would, indeed be beautiful. Just when you think you're watching yet another lame (a common phrase today) Axe Deodorant commercial with the ubiquitous lower lip-biting horny hottie eying the dumbfounded geek and are ready to toss it off as a waste of production dollars, you are rewarded with a moderately amusing ending. Amusing enough to cancel out where the impending lameness was headed. The Boogie Man is Just Some Guy -- Until NIGHT Falls. For Sylvania Light Bulbs, JEH United/Bangkok created a spot that makes highlarious use of Thailand's mythological monsters. And one transvestite. The premise: when the lights are on, nothing seems to be scary. Slogan: "Light is your true friend." David Griner of AdFreak fame has convinced his agency, Luckie & Co, to launch The Social Path. It's a clean, uncomplicated and sane place for learning about social media. The blog went live Sunday. I don't want to gush much, but I spent most of the last half-hour reading the entries. If you're looking for rants or hype-ridden miracles, you will probably be disappointed. What it will do is simplify topics that have become extremely noisy. And then it will walk you through them while clasping your hand -- not as an "expert," but as a person learning alongside you. For a sense of what I mean, read his second entry, Five Myths of Social Media. It's a great place to get started. If you've ever wondered what astronauts discuss while floating around doing jack, 72andSunny has the answer: like any other dude at a dive, they're probably talking about TV. Here are three spots, each of which is for a different Discovery Channel TV show. Guess which promotes what. Answers on AdGabber. o "I'm gonna go with lunar golf." o "Y'ever blow up a zeppelin?" o "Okay, I think we'd call it Money. With an exclamation point. As in 'we're making tons of money,' and 'we're so money at crabfishing'." One thing I don't get is why the astronauts have Earth for a face. Maybe it's a logo thing. Anyway, it's unsettling. In this charming new spot for its "Save Today, Save Tomorrow" campaign (an unwieldy URL if you ask me), EDF Energy enlisted Miklha Singh, Anne Packer and Sammy Lee to reflect on their Olympic glories, using "recycled" footage of them in their prime. The ad concludes with a shot of the adorable Lee and the tagline, "This commercial was made from recycled dreams." Better recycled than left broken, I guess. The spot was created by FEEL Films for Euro RSCG/London. It marks Phase II of EDF's "It's not easy being green" campaign -- another effort that appears to have been shaped in the blistering flames of nostalgia. I liked it a great deal, even with the epilepsy-inducing London 2012 Olympics logo at the end. It's been confirmed: vibrating banners can kill. Because no man is safe where the banner ads dwell -- not even if he's the type of man who confuses J-Lo's lips with Angelina's. For last weekend's Glastonbury Festival, GotWind.org partnered with mobile firm Orange to launch the REcharge Pod, a mobile phone recharging station powered entirely by wind. The companies pitched a windmill-mounted tent where people could charge phones without using ordinary power sources. The pod recharges 100 mobile phones per hour; any unused energy is stored in its Manbat battery bank. 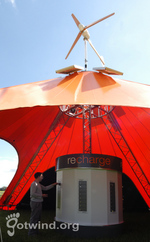 This was the REcharge Pod's second year at the Festival. Thanks to in:fluencia for the tip.